(John Roark | The Idaho Post-Register | The Associated Press) In a June 7, 2018, photo, Lael Andersen, owner of Drink-N-Dash, serves up a soda to Jon Burleson in Idaho Falls, Idaho. Soda shops, also known as soda shacks, have become a mainstay in the region. Idaho Falls, Idaho • Nearly 50 bottles of flavoring line the walls of Lael Andersen’s 10-foot-by-20-foot shack on Northgate Mile, featuring common choices such as raspberry and cherry, to more off-the-wall additives such as cupcake. These flavors help make carbonated concoctions that in the past few years have taken eastern Idaho by storm. Andersen opened Drink N Dash last July with the intent of starting a fun new business. Alongside her 10-year-old daughter, Taybree, Andersen serves up drinks to customers as they pull up to the shack, or delivers to Idaho Falls schools and businesses. Soda shops, also known as soda shacks, have become a mainstay in the region. In the past two years, nearly a dozen of these businesses have opened in the region, providing an alternative for those seeking a caffeine boost. Shops range from roadside and parking lot shacks to elaborate stores, featuring flat-screen televisions and creative ambience. Some offer snacks such as cookies or popcorn, but all feature creative drink mixes and create-your-own options with a variety of flavors. But what makes these locations so popular? Andersen believes it is a combination of the area’s culture and the simple desire of a fun, different drink on a hot summer day. The workload of this job has kept the mother-daughter duo on the road and behind the counter more often each month since they opened the location. Other soda shop businesses in the area have seen opportunities to expand with the rising popularity of these drinks. Rigby-based The Fizz Bizz opened a second location in Idaho Falls in October. And manager Kori Madsen said the business expansion, so far, has been a success. Madsen previously worked at the Rigby location but has enjoyed her experience in Idaho Falls. Ammon residents Rob and Shana Erikson frequently visit area soda shops with their family. And on a recent trip to The Fizz Bizz, the family sat down to enjoy a variety of drinks. Idaho Falls resident John Burleson also frequents these locations and calls Andersen throughout the week to make sure she is not out on delivery before heading over to Drink N Dash on his lunch break. “Drink N Dash here is awesome,” he said. “Their delivery system is excellent. She’s going above and beyond what a normal facility should do. Burleson’s go-to drink is the No. 9 at Drink N Dash, which features Dr Pepper with splashes of cupcake, strawberry, vanilla and cream flavoring. Andersen said this is the most popular drink on the menu. 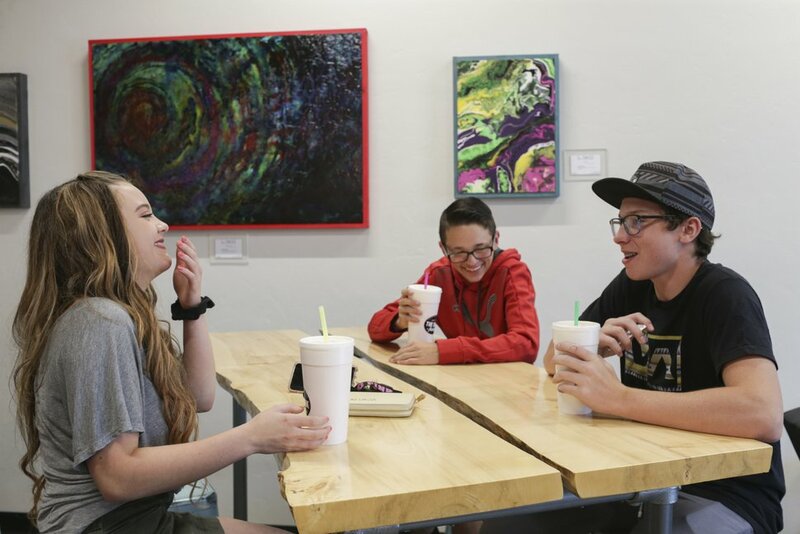 (John Roark/The Idaho Post-Register via AP) In a June 7, 2018, photo, Laurna Chapman, Landon Pinnock, with hat, and JR Chapman have sodas at The Drink Factory in Idaho Falls, Idaho. Soda shops, also known as soda shacks, have become a mainstay in the region. While soda shops often feature a variety of drink options, with creative names such as the Ace in the Hole or Cherry Bomb.com, one of the most attractive facets of these businesses is the ability of customers to experiment and find their own flavors. Once some find that perfect combination, it’s hard to change. “I’ve kind of found what I like, and it’s tough to deviate and get adventurous sometimes,” Rob Erikson said. His go-to choice is a Mountain Dew with strawberry and mango puree flavoring. The options are endless, and Andersen believes the popularity of these businesses will continue into the future. “I think the popularity comes from, they can take anything they want and mix with it,” she said. “It doesn’t have to be anything on my menu. If you pull up and like Sprite with watermelon, you can do your thing.